When I placed my Phat-Fiber-didn’t-happen-consolation-prize order of 8 oz. 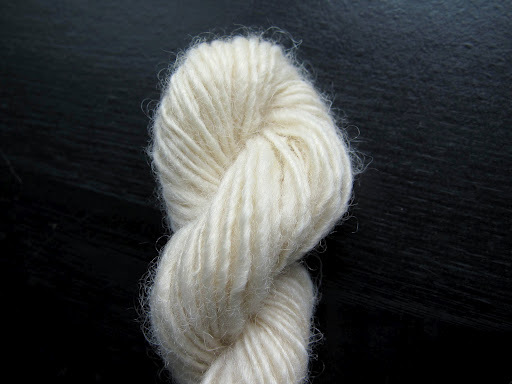 of a merino/silk blend from Natchwoolie, I added a little 0.25 oz. sample of Bluefaced Leicester top because BFL was not one of the 16 breeds included in the Woolgatherings sampler pack that I’m basing my Spinner’s Study on and I’ve been itching to try it. Since I had just finished the rainbow-tastic yarn that occupied my Golding spindle for months, I figured I’d spin up the bit of BFL fiber while it was free so we could have a little Spinner’s Study bonus! 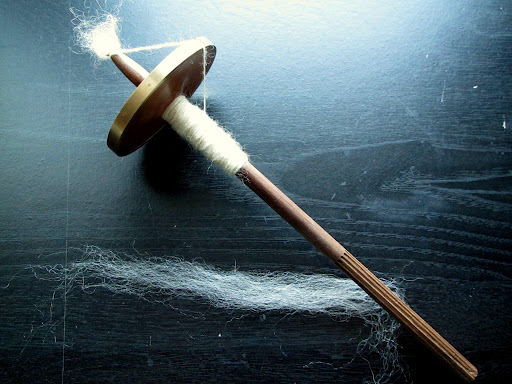 (The Cormo is still being spun on my other spindle.) Now, down to business. What a nose on these guys! Photo from http://bflsheep.com/. The Bluefaced Leicester breed (pronounced “Lester”, fyi, which sounds way better than the “Like-ester” way I was saying it in my head!) is part of the aptly named English Longwool family. According to the Fleece and Fiber Sourcebook, they are a very old family that is likely descended from a breed brought to Britain from Ancient Rome and their wool is distinguished by its long staple length. BFL wool has shorter staple lengths than the other breeds in this family (such as Border Leicesters and Leicester Longwools) but they still range from 3-6 inches in length. The micron count is between 24 and 28, on the finer side of the ‘medium’ range of softness. This fiber is devoid of any kemp or guard hairs (yay!) so it’s definitely soft, but its most striking feature is its shininess. It has almost a silky quality when spun with lots of luster. It drafts very easily and spins well, no complaints at all in that department. Another neat thing about BFL wool is that it is relatively widely available in commercial yarn. It was the first non-Merino, non-“generic wool” yarn I’d ever used. Knitting with Merino and then knitting with BFL is a great lesson in how the properties of the breeds’ wool greatly affects the feel and behavior of the yarn. 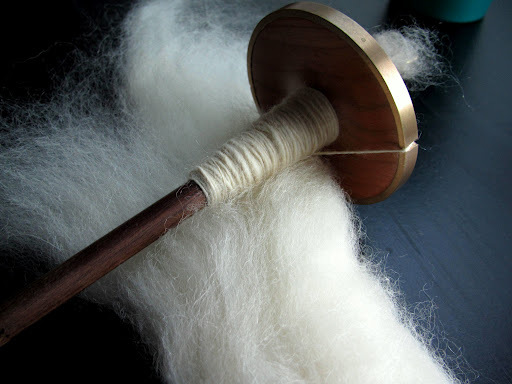 Where Merino is extremely elastic, bouncy, matte, and soft, BFL is more drapey, can be denser, and is usually shiny. 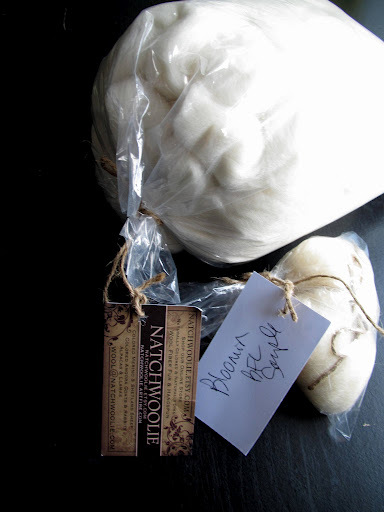 It’s pretty neat to compare the two and I recommend you try it if you have the chance, keeping in mind that the way the yarn is spun affects its behavior as well. I like my teensy skein of BFl! I’ll have to get more. Well folks, that little bonus will have to hold you over for bit because as you’re reading this I’ve escaped to the woods for a much-needed weekend of unplugging from computers and reminding myself of my camp-lovin’ outdoorsy roots. I love reading your posts like these because I honestly learn so much! I also always said it in my head like like-ester so glad to know how to say that before I embarrassed myself. That fiber and yarn looks so gorgeous! Heehee, I love your little mini BFL skein too! It is a fun fiber to work with, although I prefer it with a little bit of silk blended in. I also really love your idea of the Phat fiber box consolation prize order, it's almost like a win-win! The BFL skein is so pretty and fluffy. That you for sharing, I really will have to try some BFL sometime, I have yet to do so. haha, I didn't know either until I read it in the book. Glad to hear you like these post, I like writing them! I liked it a lot, I also like knitting with it for a change from merino.